Three O'Clock Bears: Ickle Mo....available now! 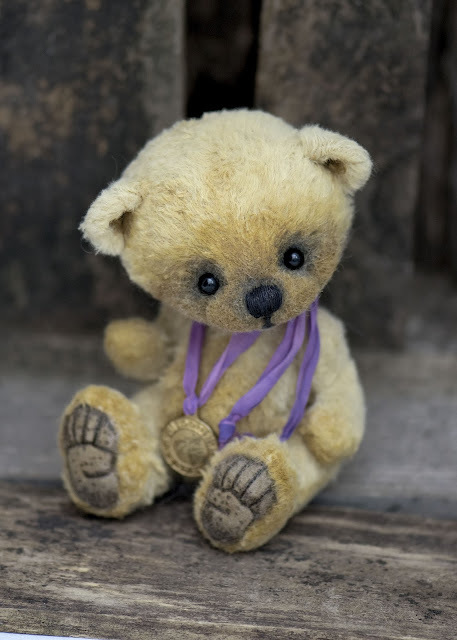 To Celebrate the 2012 Olympic Games I am delighted to introduce Ickle Mo. 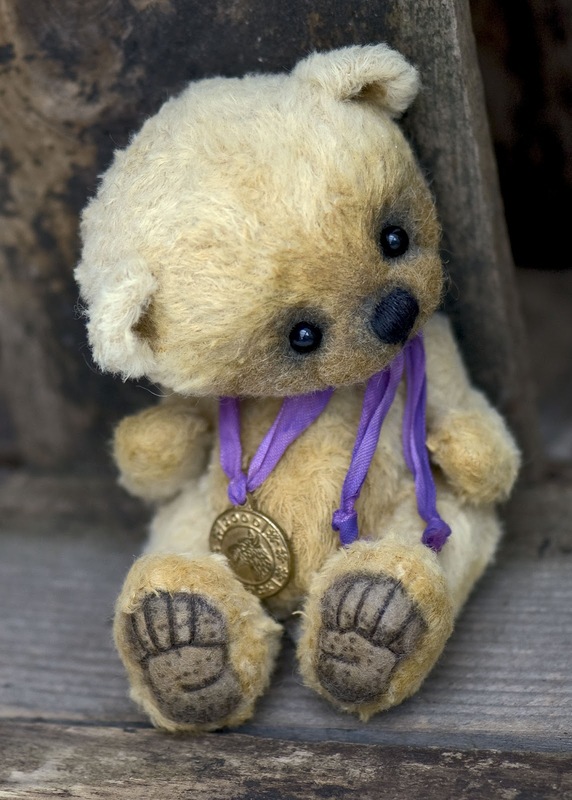 This sweet little bear measures just under 6 inches and is made from pale gold Schulte viscose. He has a sweet needlefelted, expressive face which I have hand shaded. He has shaded and sculpted felt foot pads in grey brown. He is just a handful and I have weighted him with steel ball bearings for added stability. He is wearing a purple winning ribbon with a vintage gold medal attached, bearing the words 'GOOD LUCK' ...so I hope he will be someones good luck charm! 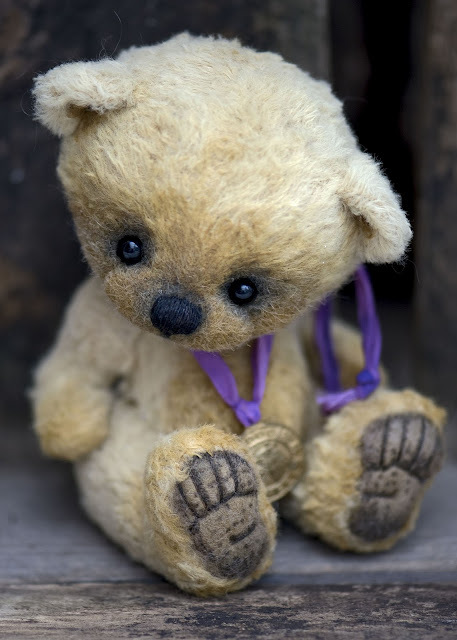 Though I am not known for creating aged bears, prefering my newly made characters to acquire their own true provenance, this little bear has a dishevelled look which gives him a slightly aged look...which is quite different from my regular designs. So I am hoping someone out there will love him enough to give him a home amongst their hug! It is always hard when doing a new design because while I like to push the envelope it's not always what collectors expect, or want. 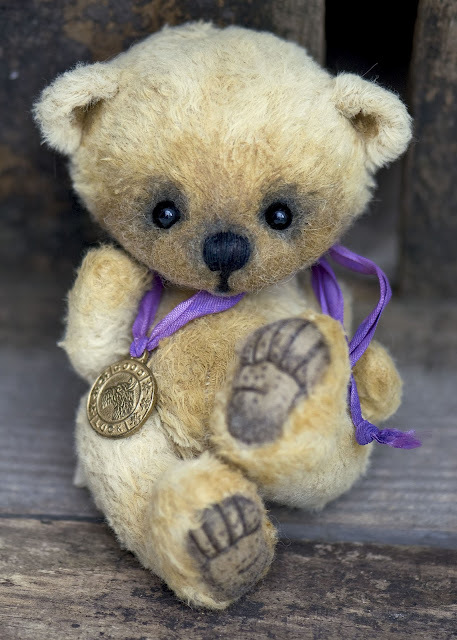 My last lttle bear, though slightly bigger, was very much in the same vein and I do hope that these sweet little souls will become a Three O'Clock staple in the future as I very much enjoy the hand sewing and the teeny-ness ( if that is a word!!) of their personality! His adoption fee is £175 and includes UK postage. European and Republic of Ireland address are £5 postage and the rest of the world £10. Click on the correct amount from the drop down menu below to include postage. Ickle Mo has now been adopted...HUGE thanks!!! 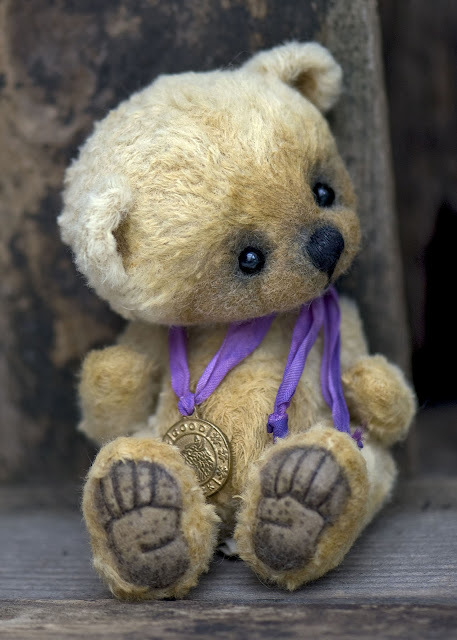 He is so huggable Jenny. I love him.